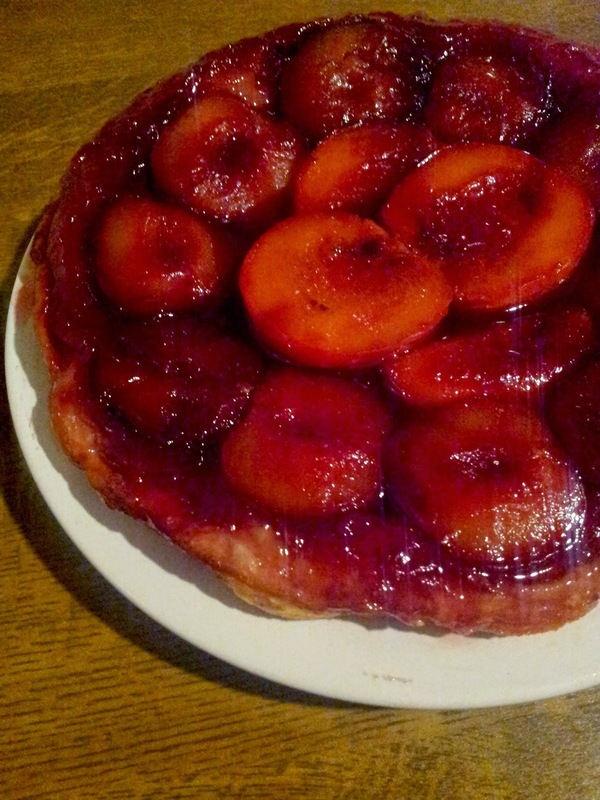 Sticky, boozy, plum and cherry brandy tarte tatin. Yum! Want a simple, boozy dessert to impress friends this weekend? Take a few plums, sugar, butter, pastry then add cherry brandy et voila, you have Plum and Cherry Brandy Tarte Tatin. First, let's start with the (second) most important ingredient, the cherry brandy. I've used Tesco Finest* Cherry Brandy, a) because it's absolutely, lip-smackingly delicious and b) it's only £9.00 for a 50cl bottle. The Tesco Finest* Cherry Brandy is a rich, full liqueur made from a blend of Morello, Challonaise, Iragana, and Black cherries, macerated in French brandy. You should be able to find it on the shelves of most larger Tesco stores - if not now, then definitely in the lead up to Christmas. 2. Melt the butter in a tarte tatin tin (or medium sized frying pan) on a medium heat on the hob, stirring in the sugar once melted and the pinch of cinammon. Add the cherry brandy, stir to combine and simmer for a minute or so. 3. Gently place the halved plums flesh side down (skin side facing up) into the liquid mix and leave to cook on the hob for about 10 minutes. You can give the pan a shake or use a spoon to coat the plums in the caramelised juices. Take of the heat as the sauce starts to thicken. 4. Unroll the pastry sheet and prick all over with a fork before gently (but quickly) laying it over the plums. Taking care (the juices are super, super hot) trim the pastry to leave a rim of about 2-3cm then tuck the pastry into the tin/pan so it is snug around the plums. 5. Bake in the middle of the oven for about 20 minutes or until the pastry is risen and golden in colour. When done, leave in the tin to set for about 5 minutes before loosening the pastry edges from the tin/pan gently with a knife. 6. For the 'voila!' effect carefully turn the tarte out onto a plate by placing a large plate over the pan and quickly but gently flip. The tarte should come out easily and oozing with caramelised juices. If you've got leftover bottles of other liqueurs in your liquor cabinet, you could also try these other combinations - just substitute the brandy in the recipe above. Good luck and have fun experimenting!